A passer-by was killed at a protest against Venezuela’s government of President Nicolas Maduro in the western state of Tachiram. 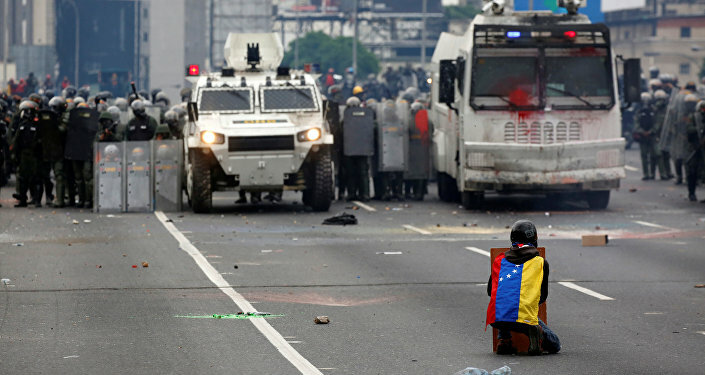 MEXICO CITY (Sputnik) — A passer-by was killed Wednesday at a protest against Venezuela’s government of President Nicolas Maduro in the western state of Tachiram, local media reported. Manuel Castellanos was allegedly shot in the back by government troops who were firing at protesters in the town of Tucape, El Nacional newspaper said. The 30-year-old was not taking part in the demonstration, the paper noted, but was going about his business when he was struck. He reportedly died shortly after being taken to a health center. This death has brought to 44 the number of people killed in Venezuela since the start of protests in early April. Opposition activists accuse President Maduro of mismanagement that has led to a deep economic crisis in the country and call for an early election.